You've probably seen snippets of him from here, here, and here. ..too smart for his own good..
Miss him when he was this tiny last summer.. photo taken during my bridal shower. Above photo was taken around Halloween last year! I was playing around with some of my makeup and did a masquerade-ish butterfly mask. Ended up I didn't use it for my Halloween costume. Bummer.. But I really want to re-do it for a makeup tutorial. I promise! Same with the other tutorials I wanted to show as well! Before I end this post, here are two Halloween pics of Kobi all dressed up! hehe.. I hope everyone is having a great week so far! We're almost to Friday! 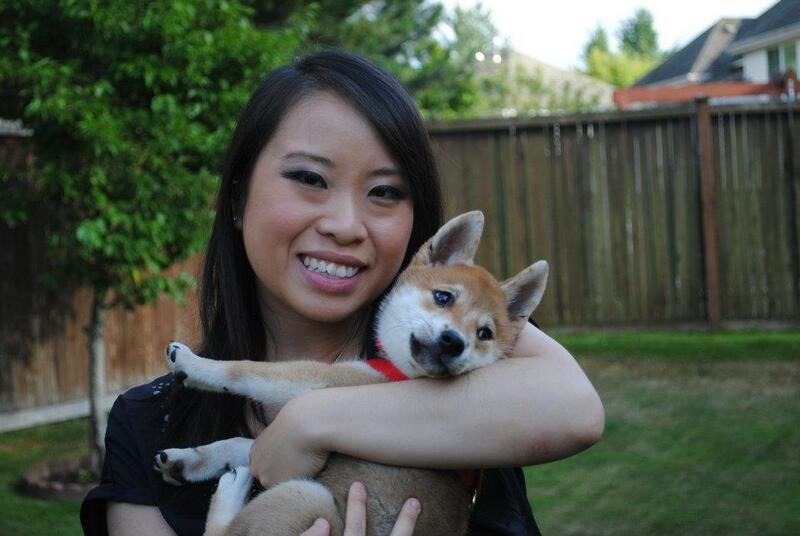 ahhhh i love shiba-inus!!! they're sooo cute. HAHAHA! Kobi is just too cute! I am loving his Halloween costumes. HAHAHA I use to dress my dogs up for the holidays too. They loved it! Aww he is so so cute and I love his shark costume, very funny!! awe what a cute pup!!! xO! He is super adorable! Love the pic of him when he was a baby awww! What a beautiful little friend. Gotta love how you dressed him in Halloween costumns, cute and hilarious. I dont have any dogs at this time, perhaps i can try to dress my cats this Halloween. Kobi is absolutely adorable!! I love that he's scared of flies - too funny! Kobi is so cute! 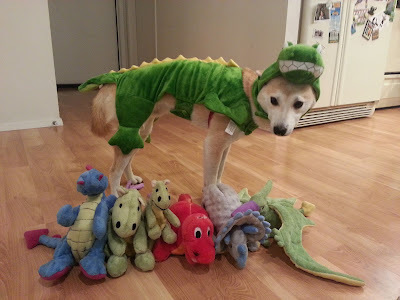 Love the shark costume photo the most (dinosaur Kobi is a close second). he is absolutely adorable!!! i miss my dog when she was a puppy toooo....they just grow so quickly! Sooo cute! Shiba Inus are so adorable! Oh my goodness, Kobi as a 'shark attack'.. I can't even handle it. SO CUTE! Oh my gosh him in that costume is so cute!! Awww he's adorable!!! I love dogs. I wish I can have one, but my apt sadly doesn't allow any pets. There's nothing sweeter than hugging a dog, because they're so loving with you no matter what. Love the pics of him in the costumes haha. My husband and I dream of having a shiba inu one day!! omgosh your fur child is sooooo cute!! i love love his halloween costumes!! so adorbable!!! Omg stop...what a sweetie! Absolutely LOVE his Halloween costumes, by the way! He is so freaking adorable! Omg so precious. OMG this post made me smile SOOOO big! He s such a cutie! I can't even handle how adorable his costumes are LOL! Kobi is reaaally gorgeous, he is one lucky baby for having such a wonderful Mommy! Kobe's costumes are too cute!! Oh my goodness, he is adorable! Oooooh I love your butterfly... so nice ! Aww he is so adorable! I want a pet so bad but I don't think I'm ready for the commitment and responsibilities!! He is one of the cutest dogs I have ever seen! Those costumes are something else! Oh my gosh. Too cute. Too too too cute! aww kobi is sooo cute, love the shark costume! And I'll follow you back right away! I miss having a dog! : ( Kobi is absolutely adorable! Kobi is super cute!! 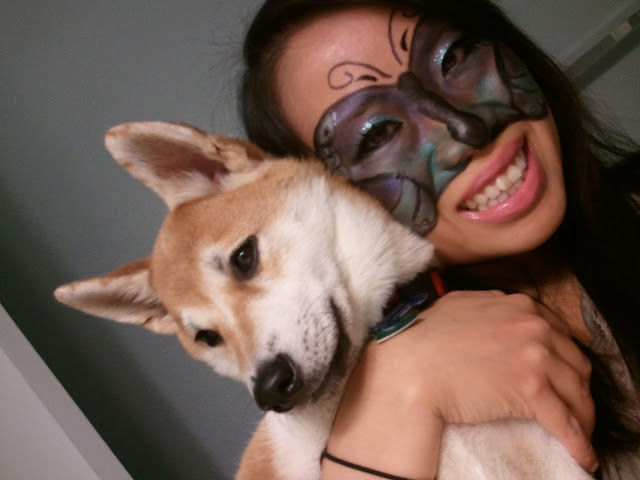 I love Shiba dogs and your makeup looks amazing!!! thanks for dropping by. we love your comments. how adorable! mind if you help me get started with my blog and follow me back? thank you! Che carino <3 :D Reb, xoxo. Aww he's so adorable! How funny that he's scared of flies. The costumes are so funny!!! Hi, I am your newest follower and you have such a wonderful blog! Hi dear Sheila! Yep, my hair was driving me crazy, I was glad to cut it! Your fur baby is adorable, I have always wanted to have a dog too. Never had the chance though! The shark disguise is so funny! I love him!! He is too cute! Awwwwww, Kobi is soooo adorable!! I totally love him in the green dinosaur outfit, so cute!! Oh my word! He is too cute for words! And so tiny last summer! His shark costume is to die for! ohh he adorable!!! Give him a big hug from me!! OMG he is the cutest dog ever! and those costumes are to die for! OMG can I just tell you how jealous I am?!?!? Besides a pug, a shiba is my second favorite dog and I WANT ONE SO BAD!!!!!!!!! Kobi is soooo cute and I love all of the costumes!! awww so cute!!! and I love the halloween costumes :) Absolutely adorable! aww so cute! Love your blog! want to follow each other? SUCH an adorable dog!! this is definitely one of the breeds i would consider if i ever get a dog! aw your dog is soo cute! That whale costume is so creative and awesome halloween makeup! I love shiba inu:) The royal dogs! You are so lucky to hve one in your family! Great post!!! 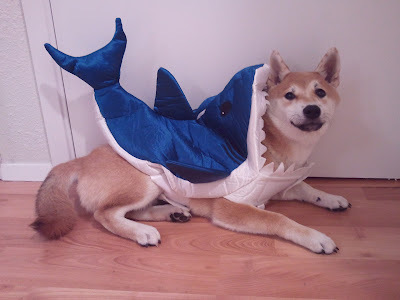 The dog is wonderful with the shark costume!!! Nice blog!I follow you.Can follow me back please? omg so cute! hahaahahah the Halloween outfits are too funny. I want to get one for my Pomeranian this year! ha ha Kobi is so cute and with the halloween outfit. That make up of yours turns out really great. I need practice. Seeing you with your Kobi I think we need to get a new one. Our dear Sharmon died this year and he was 10 years old. This is so cute <3 I love the shark costume!! OMG, the shark costume is the cutest I have seen. Kobi Rocks! Ah he is sooo cute! Love the shark costume haha! Sheila, Kobi is SO CUTE! I love dogs and I literally LOL when you said that he has a blog. Love this post! Have an awesome weekend. Aww! Your "other boy" is so cute! How fun that he has his own blog too! He must feel so special! Do share with us your make-up tutorials... you look great! very nice picture... lovely post dear! Hi dear thanks for the comment! for the DIY's photos I used photoshop! aaah! *die* i've always wanted a shiba inu. too cute! hahahaah Kobi is just the cutest! I love how you dress him up in costumes like the shark one...lol! OMG Sheila!!! Your furbaby is adorable. Hi Kobi!! I love his Halloween costumes. My little furbaby is going to be a mermaid for Halloween. hahaha. Hope you're enjoying your weekend, too! Thanks for always leaving such nice comments. They definitely put a smile on my face. I'm Italian girl and I don't speak english very well! 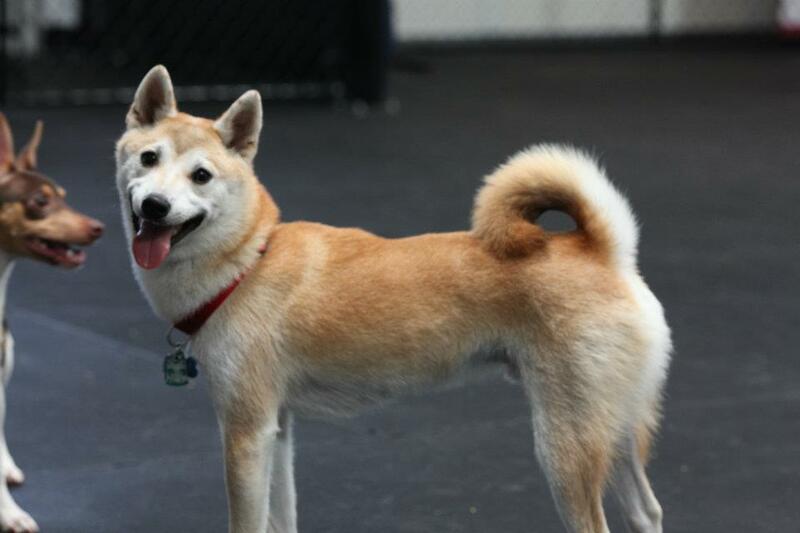 shiba is a very cute dog, thanks for your comment on my blog! Hahaha! So darn cute. I love the shark outfit. I've never seen that one before. I have my dogs in costumes too. It is too hard to resist!